The self-styled “World's Most Famous Limousine Driver” Mike Hughes, 61, has suffered a setback in his attempts to prove the Earth is flat. On Saturday, a federal agency blocked his homemade rocket launch by withholding permission to use public land. The steam-powered rocket was scheduled to take off in Amboy, California, a ghost town in the Mojave Desert along route 66, but Hughes couldn't get permission from the Bureau of Land Management to conduct the launch. Hughes claims he was given verbal permission over a year ago while awaiting final approval from the Federal Aviation Authority (FAA). A spokesperson for the Bureau of Land Management (BLM) told the Washington Post that there were no official records of contact between the agency and Hughes and that he had not requested the special recreation permit required to conduct the launch. "Someone from our local office reached out to him after seeing some of these news articles [about the launch], because that was news to them," BLM spokesperson Samantha Storms said, as cited by The Washington Post. Hughes, who had previously claimed, “There’s no difference between science and science fiction,” and that “John Glenn and Neil Armstrong are Freemasons,” is an amateur scientist who made his first manned rocket in 2014. 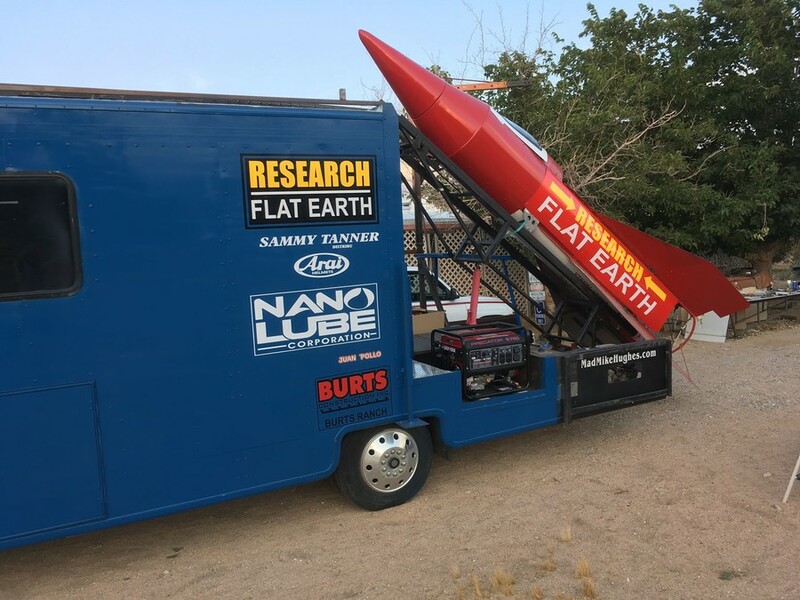 He’s only a recent convert to Flat-Eartherism, which may have been spurred on by a failed Kickstarter campaign which only managed to raise $310 of the target of $150,000. His conversion was made on-air, after he called into a radio show that is popular among the flat-Earth community. Hughes does, however, employ round-Earth technology (or just technology) for his vehicle. Hughes has secured another, privately-owned launch site for his 500mph (804kph), mile-long flight through the Mojave Desert which he hopes will draw much-needed attention to the movement and will mark the first step in his flat-Earth space program. He hopes to garner enough funding to conduct a journey into the atmosflat to finally disprove the vast intergovernmental, interagency conspiracy shielding us from the truth: that we live on a flat disc, floating in space, surrounded by a giant ice wall.